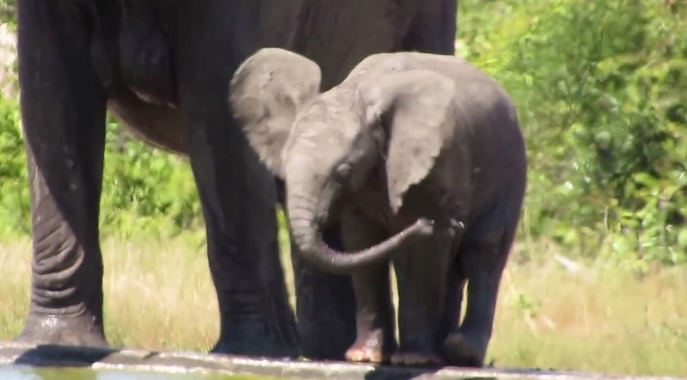 This cute elephant calf didn't ask to be born with a long, protruding trunk planted squarely in his sweet little face, and quite frankly, he's not sure just what he's supposed to do with it. He was spotted earlier this year at a watering hole with his family in South Africa's Kruger National Park, struggling, it would seem, to figure out how to use his most distinct appendage. While all the grownups around him casually pull up water with their trunks, spraying it into their mouths to drink (you know, like normal), the confused calf instead waves his tinier trunk about like a pool noodle. The technique, although quite a spirited one, does little to quench a parched little elephant's thirst. Next, he tries splashing water up into his mouth, not unlike how a dog might do it. But that too isn't so effective. Thankfully, by the end of the footage, the thirsty youngster seems to have gotten back on track with how to use his trunk, finally pulling up what appears to be a few big, satisfying gulps of water. Responses to "Adorable Little Elephant Doesn’t Know How To Drink With His Trunk "